Too often, women scientists labored under the shadow of men, but that was only partially true in the case of Caroline Lucretia Hershel, our Women’s History Month spotlighted scientist. Caroline was born on March 16, 1750 in Hanover, Germany. 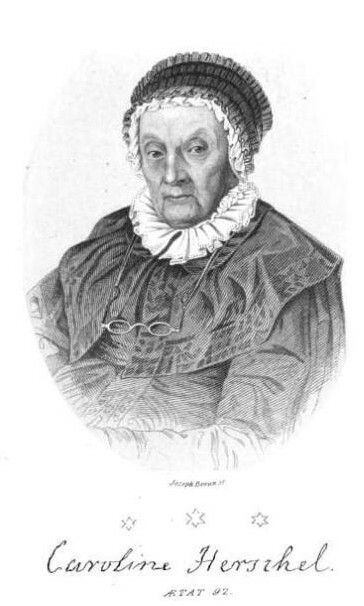 Her father, a talented musician, encouraged all his children to study music, as well as math and French. Her mother felt it was a waste of time for girls to be educated, especially Caroline, whose growth had been stunted by typhus. Caroline became the “drudge” of the family, as she called herself, until her brother invited her to England where she studied astronomy and helped him make telescopes. Caroline worked closely with her brother and excelled as an astronomer, but on her own she is credited with discovering three nebulae and eight comets as well as cataloging all her own and her brother’s discoveries. She was a trailblazer and an accomplished female scientist, way ahead of her time. 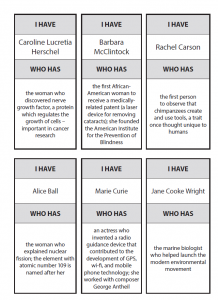 Attached, you will find a version of the game, “I Have, Who Has?” featuring Herschel and other female scientists. Some were trailblazers, who paved the way for other women to attend universities and earn graduate degrees in science, math, and engineering. These trailblazers helped other women secure employment and recognition for their contributions. For their achievements, many of the women earned great recognition, such as the Nobel Prize and awards from presidents and nobility. The goal of “I Have, Who Has?” is for students to come away with an appreciation of the significant contributions women have made over the years in all fields of science. 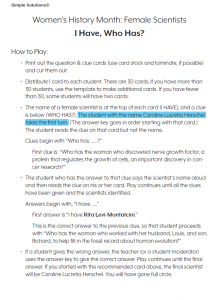 Assign these graphic organizers to help students learn about five of the 30 women scientists and prepare to play the game. Each graphic organizer directs students to use two of the websites from the list below. These websites provide the reliable information they need. 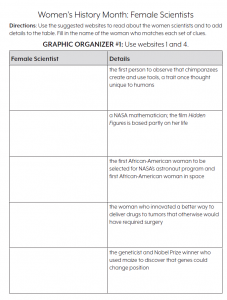 While doing research, students will become experts about the female scientists assigned by their graphic organizers. Throughout the month, assign groups of students to give brief presentations on the scientists listed in their graphic organizers. In no time, your class will be ready to take the I Have, Who Has? challenge. 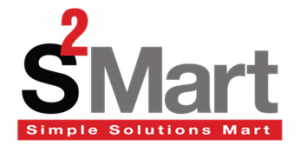 The Directions and Answer Key are located at the end of the list of websites. 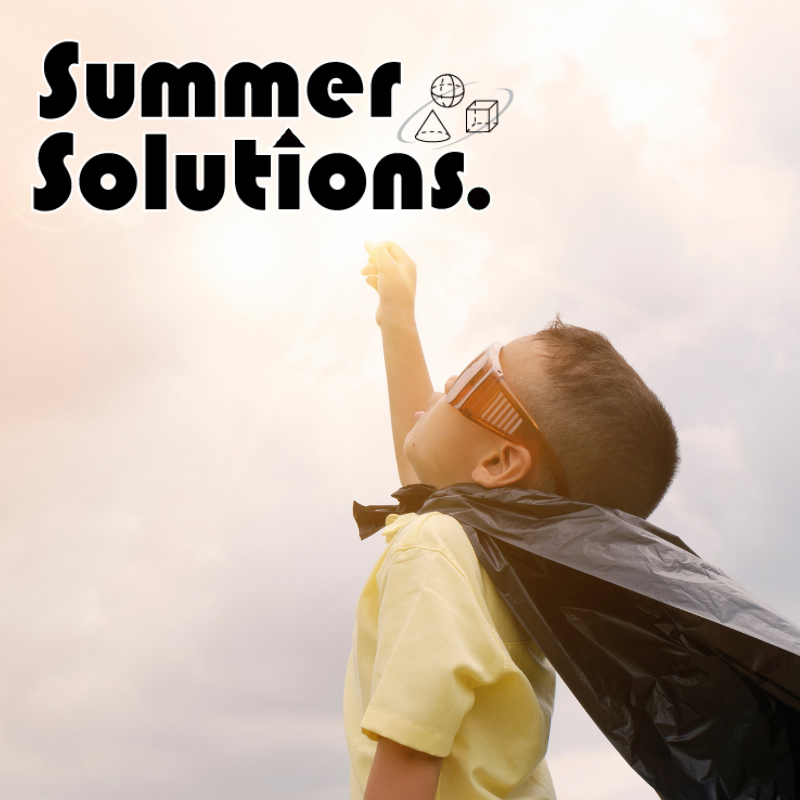 Holiday House, publisher of the biography Caroline’s Comets: A True Story by Emily Arnold McCully has a lesson plan you can download from their website. The lesson plan is for reading non-fiction rather than the details of Herschel’s life.